Abstract—Odorous gases are the most significant pollution that resident argue about living in the surroundings nearby industrial park. Sustainable ammonia emission is a common odor sources in industrial areas. Odor often impacts to human sensations and upper airway irritation, principally because most volatile chemicals have the potential to activate temporary burning, stinging, tingling or painful sensations in the eyes. However, in the case of such multi-source odour emissions especially industrial park, common chemical analyses or odour concentration measurement methods are not often applicable. Although several studies have been conducted for prevention and control of odorous gases, no comprehensive research exists about recent achievements in this area. Expected to Tainan Science Park as a research area, using different kind of historical data collection with possible odor emissions from industrial park, and apply the Gaussian diffusion model to simulate contamination of receptor. Following by Gaussian diffusion model steps, connect with linear programming method and also estimate pollution contribution. Then find out the sources of pollution so that the future government utilize cases for this petition as valid reference. Index Terms—Odor, Southern Taiwan Science Park, Gaussian diffusion model, linear program. The authors are with Tunghai University, Taiwan (e-mail: sunny84053078@gmail.com, hwchen@thu.edu.tw, wychen@thu.edu.tw). 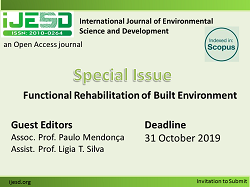 Cite: Yu-Shiuan Cheng, Ho-Wen Chen, and Yen-Hisun Chuang, "Identify the Odor Emission Sources in an Industrial Park by Integrated Data Mining Approach," International Journal of Environmental Science and Development vol. 8, no. 9, pp. 626-629, 2017.